Double stick tape is ideal for use with inlay templates. Simply place tape on the template and temporarily secure it to your workpiece. 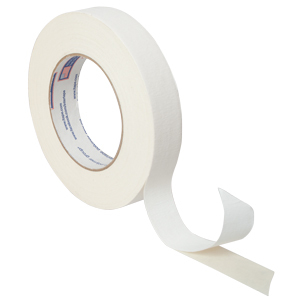 The double sided tape gives a strong reliable secure hold for your templates assuring that there is no movement while routing and can be easily removed after you complete your job with no marring or screw holes to repair. Double Stick Tape can also be used for attaching your bowl blank to a lathe without drilling holes in your stock. Note: Always make sure that your work surface areas are clean and free of dust and debris before placing tape on your stock.